Line is best known for its cross-platform messaging service, but the Japanese company also offers a bevy of connected apps and games for both Android and iOS devices. 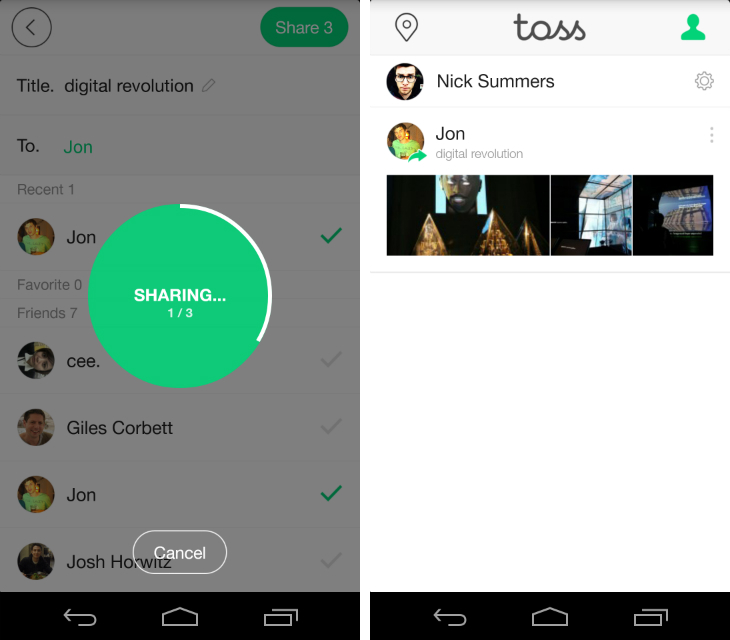 The latest addition is Toss, a mobile app that makes it easy to share groups of photos and videos with other Line users. Similar to Snapchat and casual messaging apps such as Taptalk, Bolt and Slingshot, the focus is on quick, effortless content sharing. 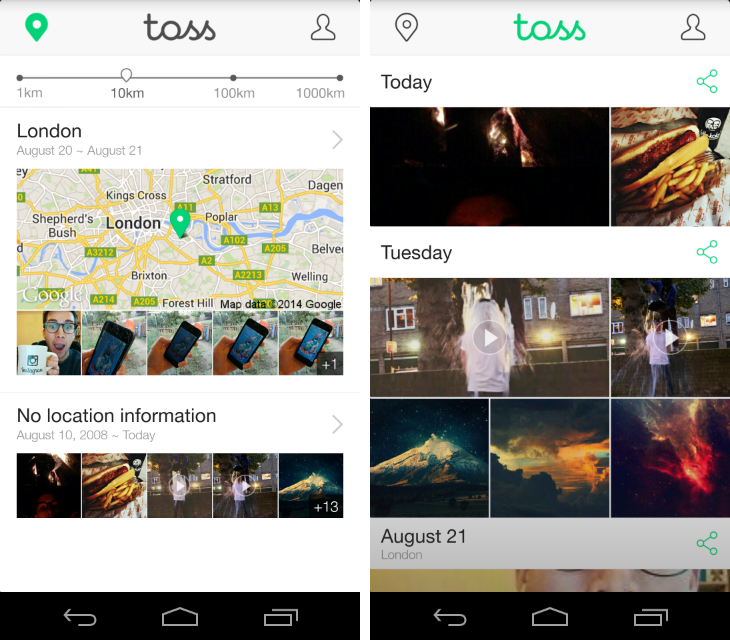 Toss begins as a third-party gallery app with two distinct feeds for organizing your content. The first is by location; photos and videos are grouped by notable places, but there’s also a slider at the top of the screen for setting the maximum distance from your current position. The second is by time; a vertical feed gives you the ability to quickly browse thumbnail previews, while scrolling at breakneck speed triggers a slick speed-reading view. Swiping horizontally will alternate between these two feeds and the purpose is to offer smart, instantly sorted albums. Although photos and videos can be sent individually, Line has clearly spent time making it as easy as possible to send batches. When you see a set you like, it’s just a matter of tapping the share button, checking the selection and hitting “Share.” From a second window, you can then select which of your Line contacts you want to send them to. A third swipe on the home screen will swap the date and location-based galleries for a share feed. Here, you can review what you’ve sent, revoke viewing privileges, delete the set entirely, or share it again with other Line contacts. Even if the recipient doesn’t have Toss, they’ll be sent a notification in the main Line app. While the best way to view sent content is inside the new app, this wider support means you’re not restricted with who you can send to. 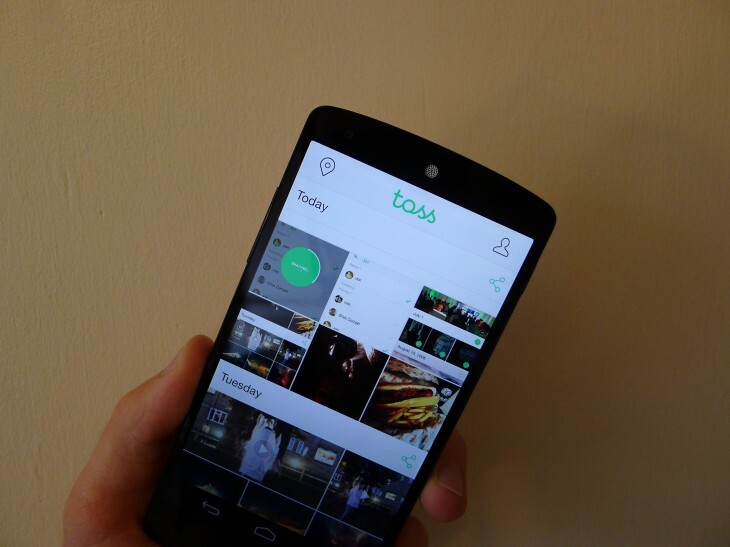 Toss is only available on Android for now, although a promo site reveals that an iOS version is “coming soon.” Will it take Google Play by storm? Probably not. Nevertheless, it’s interesting to see Line tinker with new ideas.